JEE Mains 2019 Exam dates Allotment and shift details: NTA to release Allotment of Exam Dates & Shift details @ jeemain.nic.in. National Testing Agency, NTA would be releasing the allotment of exam dates and shift for JEE Mains 2019 tomorrow, that is, October 5, 2018. The candidates who have applied for JEE Main 2019 January Examination would be able to login to their accounts on the official website jeemain.nic.in to check the exam date and city allotted to them. The information regarding the exam city allotted to candidates would be released only on October 21, 2018. As per the notification released on the official website on September 2, the exam date and shift allotted would be released on October 5. 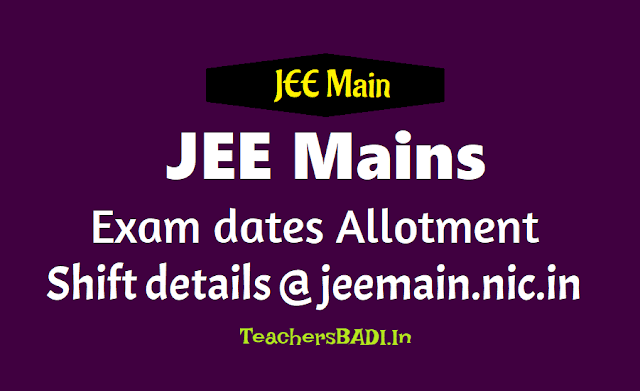 JEE Main 2019 city allotment details would be released by end of October (on October 21) and admit cards would be released on December. JEE Main 2019: The National Testing Agency (NTA) has released the allotment of exam dates and shift for JEE Mains 2019. As per the official notification, the paper 2 of JEE Main will be held on January 8, 2019. The candidates who will appear for the JEE Main examination can check the details through the official website, nta.ac.in. The first phase examination will be conducted from January 6 to 20, 2019 and the admit card is available to download from December 17, 2018. JEE Main 2019: Multiple exam dates: In another significant change, these exams will be held over many days and students will have the option to choose a date. Moreover, if a student appears for the JEE (Main) and NEET twice, the best of his/ her two scores will be taken into account. NTA would be conducting the JEE Main 2019 examination over 8 days in January. As per the information available, the examination would be conducted on Saturdays and Sundays between January 6 and 20, 2019. The results for JEE Main 2019 January examination or First Attempt would be declared on January 31, 2018. JEE Main 2019 Exam Date & Shift to be out on 5th October, City & Centre Details on 21st October 2018. JEE Main 2019 Exam Date and Shift allotted to individual candidates is scheduled to be released on 5th October 2018 by the National Testing Agency (NTA) on the official website of Joint Entrance Exam Main 2019 - jeemain.nic.in. The candidates should note that the information regarding the exam city allotted to candidates would be released only on October 21, 2018. The admit cards for the JEE Mains 2019 examination is expected to be released in the month of December 2018. The candidates who will appear for the JEE Main examination can check the details through the official website, jeemain.nic.in. The first phase examination will be conducted from January 6 to 20, 2019 and the admit card is available to download from December 17, 2018. JEE Main 2019 Multiple exam dates: In another significant change, these exams will be held over many days and students will have the option to choose a date. Moreover, if a student appears for the JEE (Main) and NEET twice, the best of his/ her two scores will be taken into account. JEE Main II 2019 in April 2019. The National Testing Agency had wrapped application process earlier last week on 30th September 2018. NTA will organise JEE Main I 2019 Examination on weekends i.e. Saturday, Sundays that fall between 6th January 2018 and 20th January 2019, next year. Candidates who have successfully registered for the same must keep a check tomorrow on the official website to know the exam date and shift allotted to them. ‘The exact date and shift allotted to candidates for JEE (Main)-January 2019 shall be displayed by the 5th October 2018 on the NTA websites viz. ww.nta.ac.in and www.jeemain.nic.in. The City allotted to the candidates of examination for Paper-1 and Paper-2 will also be available by 21st October, 2018’ according to the official note by NTA. Qualifying JEE Main 2019 will open the gateways to NITs, IITs, IIITs, and other CFTIs across the country for Undergraduate programmes like Bachelor of Technology (B. Tech), Bachelor of Engineering (BE) and Bachelor of Architecture (B. Arch). Candidates must note that it is optional for candidates to appear for JEE Main I and /or JEE Main II, as if a candidate chooses to appear for both the exams then the best score will be considered during admission process.